Margaret K. McElderry Books, 9781481475112, 256pp. WHAT CAN YOU DO WHEN YOU'RE TWELVE YEARS OLD AND YOUR WORLD IS FALLING APART? It's 1838. Jake's father has lost his job and his savings. Hearing of work in Maine, the family leaves their large home in Boston and heads north, taking with them a few furnishings--and a deep family secret. In Maine they find only a dirty, isolated farmhouse, and a job for Father that takes him away from home. "I'll have to depend on you," Jake's mother tells him. But how can Jake find food? How can he prepare for the dangerous cold of a Maine winter? How can he protect his mother--and his family's secret? Slowly, Jake learns the ways to survive, catching game and storing food for the long winter months. Nabby McCord, whose family also has a secret, helps him. So does Granny McPherson, who may be a witch. But when it comes to earning the money they need, Jake knows he's on his own. He shows his determination as the winter approaches, but does he have what it takes to bring his family together to face the future--and their past? 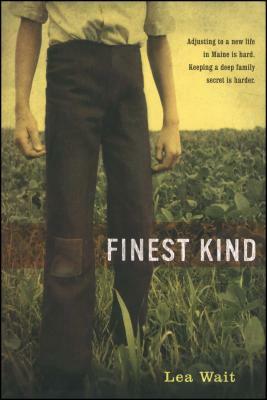 Finest Kind is the powerful story of a boy who is forced to become a man and to learn the truth about courage, friendship, and secrets.